How Familiar Are You With The Book "danger In The Desert"? Danger in the Desert isn't just a children's book; it's a great, detailed guide on surviving in desert. This book is considered a must to read. Have you done your reading? Do you know what's this book about? What are the names of two boys, the main characters ? Where's the setting of this book? They stole their mother's car and got lost in the desert. Their stepmother left them in the dessert to teach them a lesson. 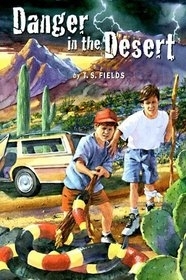 They were kidnapped in their mother's station wagon and left in the desert. They were on a field trip with their school and got lost. What were the kidnapper's original intentions? To steal and sell the car and use that money for paying his student's debt. To steal the car and run away from the police. To steal the car, kidnap the boys and ask for $1 million. Just to steal their mother's car. What does Scott do with the car? Tries to drive to back home, but runs out of gas. Leaves it in the desert along with their personal belongings. Drives it in a cactus field. Who's the author of this book? He ran away from his brother. He fell off a cliff. He broke an arm and sprained and ankle. The kidnapper went back for them. They've encountered a wild horse. They met a lost girl in the desert.